Bohemian style or boho for short, which used to be one of the most outstanding and continuous fashion trends so far, seems to never lose its popularity among fashionisers. And each year it’s becoming more popular to style various hairstyles with fabric pieces for a boho feel, even though hairbands are the most typical ways of adding color and print to your hair for a full hippy style. Recently using scarves with the same exact purpose is getting more popular. Scarves of various prints – ethnic, flower, abstract and geometric – can be added as a hairstyle accessory to any kind of casual look, dramatically changing the overall style of the hair. And since it’s easy to get your favorite scarf to your hair, let’s have a look at a few easy ways of styling hair with it. Learn the basic steps on how to style hair with a scarf and surprise your fashioniser peers with your one-of-a-kind looks every time! 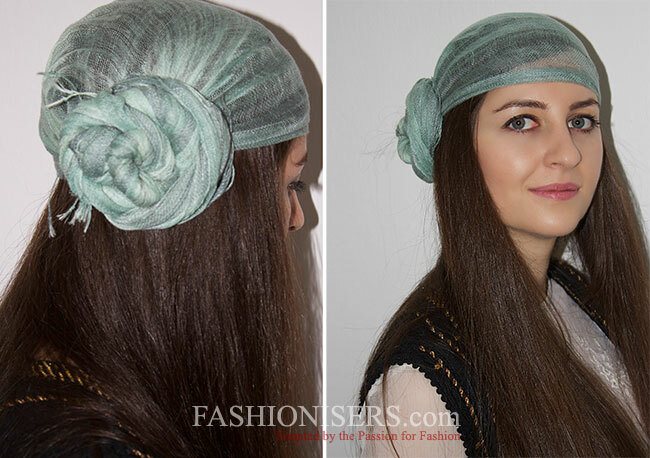 Turban headband is a well-adopted street style element among the youth. This is why learning how to tie a scarf into a turban is definitely advised. The style can be combined with typical shorts and retro style sunglasses. 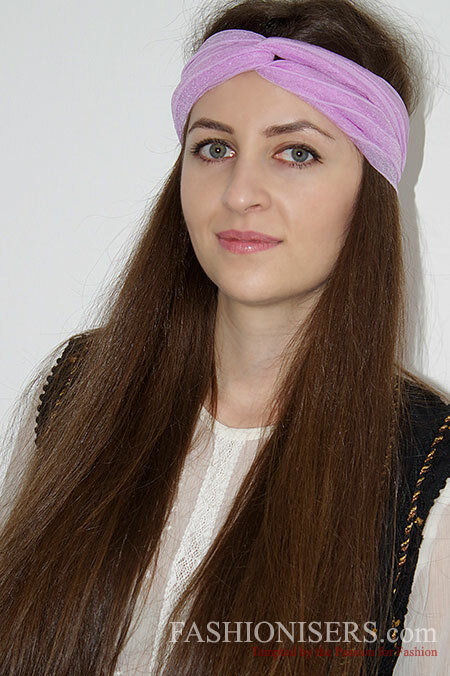 To wrap the head with a scarf in the turban style, you need to put the scarf to the back of your head and pull both of the ends to the front part. Then you need to twist the ends twice creating an elegant knot on the front part. The ends of the scarf need to be tied on the back. Another solution will be using clips to hide the ends of the scarf. In case you have a bad hair day and want to find a quick solution to fix your look, go for the cinnamon bun style, which is so easy to achieve. To get the style you can either use two to three-color scarf or just a plain one as it will kind of lose its effect when done with multicolor or printed scarf. All you got to do is put the scarf on your hair with its middle part. The free ends need to be pulled together and twisted. The twisted end can be wrapped into a flower-like form. The flower should be secured either with special clips or can be folded in a way to stay in place. The typical hair bun, which is one of the fastest and easiest ways of having an elegant updo, can be drastically transformed with a scarf. You need to start making a triangle with the scarf (if it will be a smaller scarf, the style will look more appealing), then you need to wrap the scarf ends as much as possible. The hair needs to be gathered into a ponytail. Then twist the ponytail and wrap the pony base with the hair, creating a traditional top bun. The scarf needs to be wrapped around the bun. The ends of it need to be made into a bow. The color of the scarf can be chosen based on your preferences. Braids are the flirtiest and the most versatile women hairstyles. The creativity possibilities with braids are endless, including adding a piece of fabric to it in the form of a scarf. As a result you can get a special upgraded four-strand braided hairstyle. To get the style you should use a longer thin scarf. First you’ll need to tie your hair with the help of an elastic band. Then you need to get the scarf into the elastic. The two ends of the scarf need to be added to two random sections out of four. When done with the braid, you can secure the end of it with the scarf ends making a cute bow. The traditional girlish big bow style is now frequently used by most fashionisers. And what about incorporating that same bow extension into your braid? Well, that’s really simple! You need to start making a big bow with the scarf tying the ends in a way to have one end short and keep the second end longer. When done you can clip the bow to hair with the help of hair clippers to the place where you are going to start the braid. If you want a classical three-strand braid, you need to separate three sections of hair on the back. The longer end of the scarf needs to be added to one of the sections and a traditional braid should be made. The longer end of the scarf can be used instead of the clear elastic to secure the braid. In love with Christina Aguilera’s style in her “Candyman’ video? Well, this is a very patriotic and retro style, which can be easily sported, if you wish to remove the hair off your face in a girlish manner. To get the look you’ll need a square scarf. You need to wrap your head with the scarf. Then you’ll have to tie it around your head, creating a small knot. The scarf point should be pulled up to the top of your head and rounded into a pouch in a way to have the hair inside the scarf. The scarf point needs to be tied with the first two scarf ends on the upper part of your head. Finally, tuck the open sections of the scarf into the pouch, creating a uniform look and you are done! Playing with a scarf is definitely a creative way of coming up with new hairstyles, which look both feminine and boho, at the same time being so functional! Get various stylish scarves and master your scarf-tying techniques following our tutorials!